Shopping for new prescription sunglasses? We've got you covered! With lots of different sunglass lens options and 2000+ frame options, you will definitely find a great pair here. We carry many different types of lenses for your new sunglasses. Below, we will give you a quick overview of the types. For more information, follow the link in the title to navigate to a page dedicated specifically to that type. Tinted lenses are always dark. We offer tinted lenses in 2 types: solid and gradient. Solid lenses are all one color and intensity. Gradient tinted lenses are dark at the top and fade gradually to light at the bottom. These lenses are clear indoors and turn into sunglasses when you step outside. The lenses are activated by exposure to UV. We offer FluxLD® lenses by Adnuo, and from Younger Optics we carry Transitions® VI and XTRActive. Visio-Rx.com doesn't offer the outdated clip-on sunshades, because these put scratches on your lens where the clip-on meets the lenses. Too many customers have been unpleasantly surprised with this unintended effect and we have decided to take all clip ons out of our collection. These sunshades are attached to your frame by means of magnets, eliminating the scratches that traditional clip-on shades can create on your lenses. We have a separate collection of sports sunglasses. These frames come with a variety of lenses that are easily changed, and have a separate insert behind the sunglass lenses with your prescription. Ideal for people who drive a lot. DriveWear® was specifically developed to work inside a car. They can sense and react to different light conditions, causing the lens to transition to different colors depending on the lighting conditions: overcast inclement weather, bright day with blinding glares, or just bright lights outside the car. These photochromic lenses also include polarization, which provides glare protection. Never again will you have the fear of wrecking your car as you are driving into a setting sun; DriveWear® lenses will sense and eliminate both the brightness with the proper tint and minimize the glare through polarization so you can get to your destination safely. 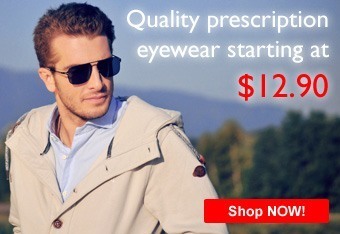 Tons of choices for you to consider when shopping for new prescriptions shades. We know you have options when it comes to shopping for your prescription glasses and sunglasses, and we hope you choose us.